Why is a daily construction report important? A daily construction report records the hourly and daily events in a construction work site. It is an important document prepared by the offsite project administrators to record several essential information, like the number of workers or employees at the site, the equipment used, progress of the job, if there are any accidents on site, etc. In this article, we will provide you with steps that will guide you with creating a daily construction report. The task will also be easier if you use the daily report samples and templates as your reference or as your own. 1. 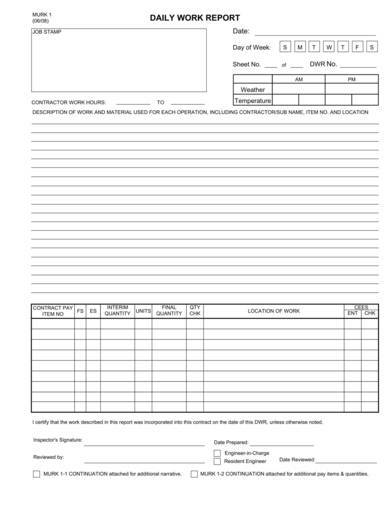 Use the company-approved daily construction report sheet. 2. Gather the required information. 3. Check the report from the previous day. 4. Do a final check. Creating a daily construction report may be a task entrusted to you in the future, so learning how to create one now will be to your advantage. Here are some steps that you can follow to help you create a daily construction report. 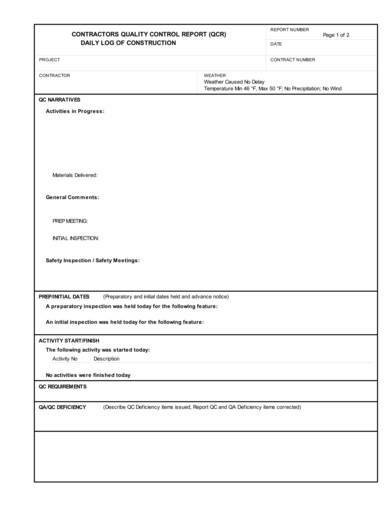 Ask your supervisor or superintendent if your company is using a specific daily construction report sheet. They would prefer you use it as it is the way they want information to be gathered and presented. If not, then you may use editable sample reports and sample daily reports, either as reference or as our own. Using the daily construction report sheet as guide, gather all the information need to complete the sheet. Doing so will allow you to provide sufficient and useful information for reporting and documentation purposes. Make sure to read instructions carefully so that you won’t miss any important information. Compare the report from the previous day with that of the information you have gathered for the current report. Take note of any unusual data in the report or differences between the previous day and the current day. It could be progress with work to about a certain percent, completion of a certain task, equipment or materials reinforcement, etc. All these information are equally important in your report. Check your work for any details you may have missed or if there is anything you would like to add. Make sure that your employee head count is accurate, including all other details. Also check for other errors that you may have overlooked. Doing so will make your work seem and look professionally done. Submit your report on the same day you created it. Take note of the time of submission and the person who received it. You should submit your report on time and to the appropriate individuals. Prepare to answer questions or get feedback about the report you just made. 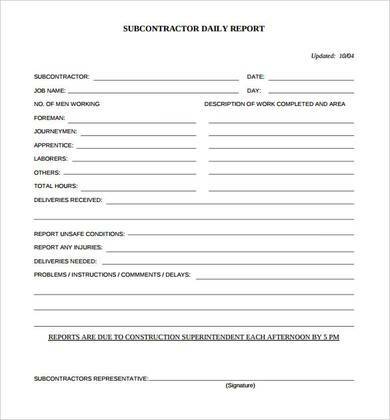 Contractors need to write their own daily reports as well and this contractor daily construction report sample is very useful. This one-page sample is not only printable, but it is also easy to fill in the required details. Check boxes are provided for the weather condition, site condition, and the specific day. This way the form can be completed quickly with ease. Enough space is also provided to write the details of the daily work report. This sample is a unique and simple template that is ideal for use in different workplaces aside from construction jobs. At the top of the work sheet is a box where job stamp is placed and beside it where the date, weather conditions, and temperature are written. Instructions are also provided on what information are required in the space provided for the summary. If you want a sample template that is easier to use than the first two samples, then this editable daily construction report sample is the one you need. This sample template is available in Word allowing you to easily make changes or add information to the document on our computer or laptop. Check boxes and lists of things to record and report are provided for your convenience. Other sections include safety, hot work activities, accidents and injuries, progress of work, etc. 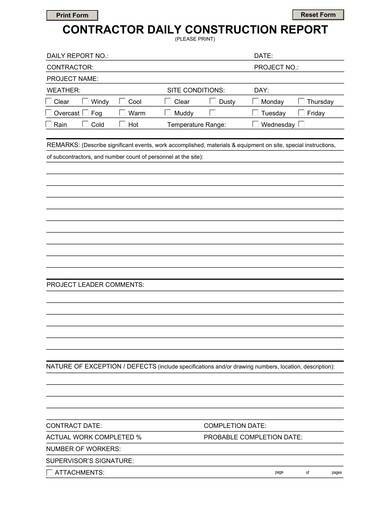 Use this report sample if you are a contractor who is working on more than one construction project. You will be able to breeze through the task of reporting because this sheet has everything laid out for you. All you need to do is fill in the required information to complete it. And since it uses only a single page, you don’t have to write a lot, just the essential details of the report. The quality of work is always a priority, so when you need to focus more on quality then you will need a sample that has its eye on quality too. The daily construction quality control report sample not only helps you report the usual activities in the construction site but also allows you to report the quality of the work done on-site. It is also very detailed and requires information, like labor hours, equipment hours, activity start/finish, QA/QC deficiency, QC requirements, etc. 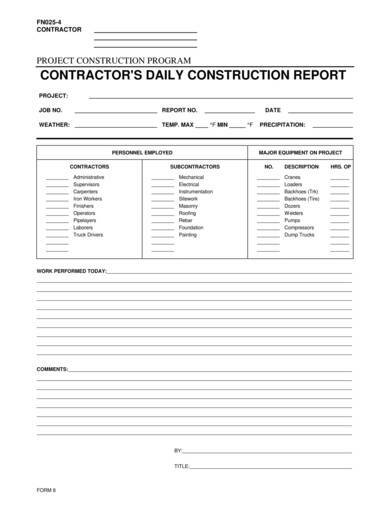 This is the simplest daily construction report template you can ever find. It is intended for use by subcontractors to report their daily work activities and must be submitted to the construction superintendent each afternoon at a specific time. The information required includes the names of the foreman, journey men, apprentice, etc. 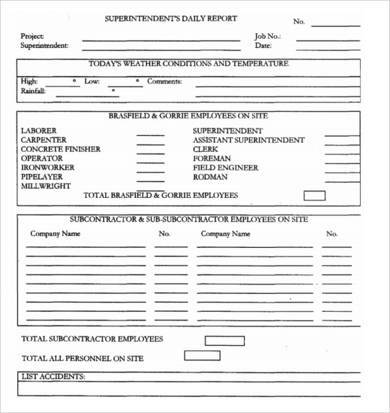 This sample is used by construction superintendent to create a detailed daily report regarding activities and conditions in the construction site. The superintendent is required to report about the company’s employees on-site, the subcontractors and the subcontractor employees on-site, etc.